With the help of some great blocking from Katrina Walter (#55) and the offensive line, QB Melissa Gallegos (#3) finds Lanika Manning for her first TD pass since 2012. SANTEE, CA (04/06/2014) In her first season back after taking a year off, quarterback Melissa Gallegos showed no signs of rust. 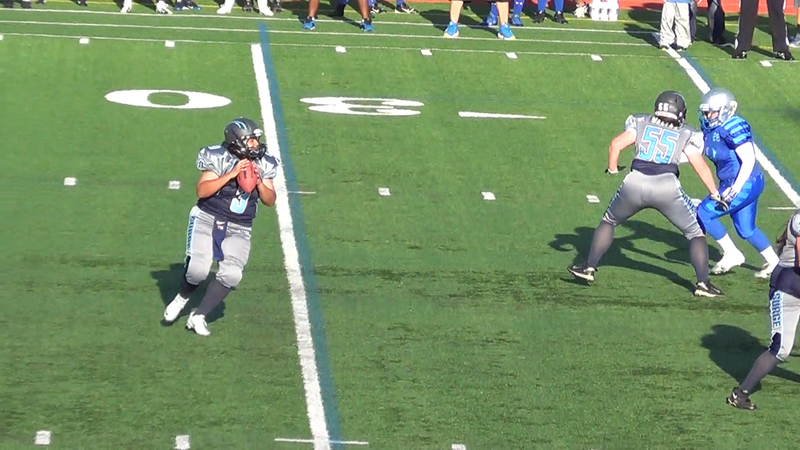 Her five touchdown passes helped the San Diego Surge (1-0) open the 2014 season with a 59-6 win over the Las Vegas Showgirlz (0-1) Saturday night at Santana High School. On the opening kickoff, the Showgirlz failed to recover their onside kick attempt and the Surge immediately capitalized. On just the second snap of the game, Gallegos found receiver Lanika Manning for a 24-yard touchdown. The Showgirlz made their way to the Surge goal line on the ensuing possession, but the Surge defense wasn't having it. The four-and-out led to a 35-yard touchdown pass from Gallego to Knengi Martin that put the Surge up 14-0 with 3:36 left in the first quarter. Martin had a big night on both sides of the ball after totaling two touchdowns and two sacks. In her first game with the Surge, Alexis Snyder showed off her play making ability with two long touchdown runs off screen passes. In the second quarter, Snyder used a combination of power and agility to scamper pass defenders for a 42-yard score. In the third quarter she outdid herself with a 43-yard run off a pass from quarterback Whitney Westman, who recorded two touchdown passes after taking over for Gallegos. The Surge got off to a 53-0 lead before the Showgirlz finally got on the board with a 1-yard run late in the third quarter. Other top performers for the Surge were Kaycee Clark, who caught two touchdowns, and Deana Guidry who caught a 17-yard touchdown and had a punt return touchdown recalled after an illegal block in the back penalty. On defense Sonfre Roberson and Carman Cruz recorded interceptions that were nearly returned for touchdowns. The Surge will hit the road next Saturday, April 12th to take on the West Coast Lightning at Linfield Christian High School in Temecula, CA.